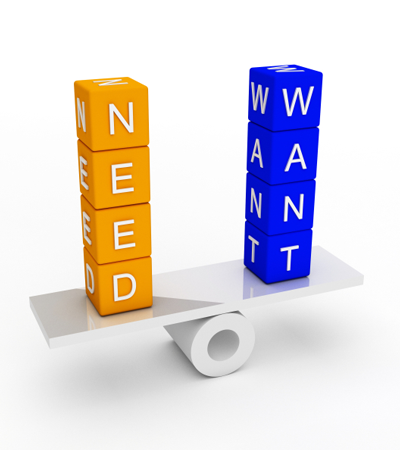 Like it or not, want sells better than need. Most businesses have products or services that people (or other businesses) need. Our target markets generally need our products and services. If not, we’d have a hard time staying in business. But we humans tend to purchase those things that we WANT more often than those that we NEED. So in marketing our products and services to that target market of ours sometimes it’s easier to make that sale by addressing the WANT. The need is easy to talk about. We’ve spent days, months, even years concepting, building, and refining our products and services. We’re passionate about them. We know all the great benefits about them: what they offer, what they do, and how gash darn cool they are! Ask any business owner about his or her product and they could talk endlessly about why you must have it…why you need it. The trick is to turn that message around and clearly define why in the world someone would want it. That’s not always the easy part, because to us, it’s more than obvious. Subconsciously we differentiate want and need by emotion. Yes, there is that logical, rational conscience that tells us we really don’t need a chocolate chip cookie for dessert, but it’s mostly that desire says, “ME WANT COOKIE!” So how do we market to that emotion? Before you can market to the want, you need to figure out what it is. Figure out what it is about your product or service that would make someone want it, and tell that story in your marketing and messaging. Imagine you are the inventor of a product that will actually deliver that elusive extra hour in the day. Ask just about anyone and they will agree, 25 hours in the day is something they need. Everyone would like to squeeze that extra hour into the day. Now think about your target market and tailor your message around what they would want out of that extra hour. Parents – Most parents I know say they would love to spend more time with their kids. They will want your product if it will give them an extra hour to play hide and seek. Amateur Golfer – Weekend golfers always want to improve their game. Ask one who has 20+ handicap and they may want your product so they can spend that hour on the driving range. Small Business Owner – Many small business owners are eternally busy, if you ask they might say they would want your product so they could just relax and do nothing. Sometimes it helps to ask your customers why they buy your product and what it is that makes them want it. And by the way, if you do invent a product that delivers an extra hour each day, let me know. I WANT it!